It was still early June and Delhi was beginning to feel like a perpetual blast-furnace. Even by the meteorological department’s predictions (which are rarely true, at least here in India) monsoons were a good three weeks away. Since I was on a break from my work, I could have easily done without going through the torture. I really wanted to escape this hell-hole, but go where? That is what the irony is. When your life and schedule is choc-a-block, you can think of thousand places to go to. Have some time at hand, and not one place can you think of! Not only that, Delhi is surrounded with options for weekend break, but most of them tend to be crowded with the same people you want to leave behind and the same situations you want to escape from. One day, while casually surfing the internet, I came across Escape Delhi’s post on Facebook where an event called “India’s Longest Downhill Cycling” was being planned. The details, on the first glance, seemed interesting. But I was not sure if mountain biking (uphill or downhill, whatsoever) was my cup of tea at all. It stated two facts clearly : it would be a weekend event and that the terrain would not have any uphill patch throughout. The latter part gave me some hope. The event was still at the planning stage and people were coming up with options like Khardunga La (in Ladakh) as that is the longest downhill stretch. After much deliberation (and recce and research by Nathan Steele), Khardunga La was ruled out as it wasn’t possible to do it in a span of 2+ days. Hence two words, “India’s Longest” were replaced by “lazy”. It pretty much summed up my being. And finally, Jalori pass-Banjar market in Himachal Pradesh was finalized. The trip was to leave from Delhi. I had chanced upon the final announcement just 24 hours before it was scheduled to start. I was in my hometown, some 5 hours away from Delhi. I quickly rushed to Delhi the next day. The bus was to leave from Defence colony market at 8:00 pm. I reached Delhi by 11:00am, ran some errands and rushed home to quickly pack a befitting weekend-trip-bag and reached Defence Colony. Despite Nathan’s strict warning, I was late by 10 minutes. We left immediately after a quick introduction with everyone. It was a Tempo traveler and I was happy that I had chanced upon my favourite seat, i.e. the first one with the unobstructed view to the road ahead. According to Nathan’s estimate, the drive from Delhi would take 14 hours approximately, breaks included. By that calculation we would reach our homestay in Jibhi by 10:00am. As we drove towards north Delhi, we got caught up in a horrid traffic-jam. The city seemed reluctant to let us go. By the time we crossed the city-limits and hit the highway, it already was 10:00 pm. The free-flowing beer and rum made everything more than just tolerable. One bloke even had local liquor from Goa, known as the Urrack. At around 10:30, we decided to take a break for dinner and informed the driver to stop over at a dhaaba. Nathan surprised me when he told the driver, “Dinner karna hai, kisi dhaabey mien” (we wish to have dinner at a dhaaba). Since he is from the UK, I did not expect him to know any Hindi. But later I understood that the kind of traveller he is, he knew India better than any of us. We stopped at Gulshan Dhaaba, which was abuzz with highway-travellers and other varieties of diners. Five minutes after we were seated, one guy with a small container walked up to us and asked if we needed a head massage. The container had four separate bowls with different kinds of oils in it. He walked around our table and asked each one of us. Everyone refused. Finally, without bothering to ask, he started massaging one chap’s head. It was comical to see our fellow- traveller’s protests falling on deaf ears. Since he was too polite to yell at the massage chap, he gave in and let him have his way. Meanwhile, I fleetingly observed Nathan chopping some green pepper (cayenne) and mentally reasoned that maybe he would have it along with the paranthas. Our dinner was served soon-after and we got busy with the contents of our respective plates. Post dinner, we quickly paid and left. That is the good thing about dhaaba(s). They mean business and are quick in service. No riff-raff. We set on the journey again. After 5 minutes of starting, I saw a disposable glass being passed around and everybody was requested to sample the content. “You are doing it for science”, they said. I could see the pieces of the chopped pepper floating in the mystery drink. Whoever tasted it, almost spat out instantly, or at least wanted to. The mystery drink in question was Urrack, with a few additives like pepper, lemon-juice etc. It equalled horse’s-piss in taste. Not that I have tasted horse’s piss, but it surely did not seem anything remotely palatable. But this activity proved to be the ice-breaker for all. Post this, one more round of rum followed and we gradually drifted off to sleep, hoping to wake up in Jibhi, or at least somewhere closer to it. At around 2:30am, I woke up to the “hiss” of a punctured tyre. I thought it was from some other vehicle. Or maybe I wished it to be so. The dark patch of the road was a bad place to have a punctured tyre. But the co-driver confirmed it otherwise. We all sleepily got down to hang around till it was fixed. The weather was extremely hot and uncomfortable even at that hour of night. I observed that worried as Nathan was, he constantly chewed upon his nails. He barely had any. All his nails were chewed right up-till where they could have been managed to be done so. Yes, these are the random things you notice about your fellow-travellers when you are stranded in the middle of the night on a very busy highway. We waited as the driver and the conductor changed the tyre. Since a bus-tyre is a bit difficult to handle, a few of us pitched in with whatever help they could manage. 45 minutes later, we were back on the road and we, once again, drifted off to snooze-land. I opened my eyes to hills all around and a couple of people discussing as to how the driver was driving in the manner one does in the plains. At one time, when we almost drove down into the valley, Nathan asked him to stop and take a break. Undeniably, it was a long journey which would have worn out the best of the drivers. After about 20 minutes, we resumed our journey. Largi was still 180 kilometres from where we were. It was still 8:00 am and by that calculation, Jibhi was still 7.5 hours away. We had a smooth drive for some 20 minutes, and then the same problem resurfaced. This time, two of us who had paid attention to the way our driver was driving, reasoned that the flaw did not lie with the vehicle, it lied with the way it was being driven. It turned out; the driver would cut the engine at the downhill drive, which eventually rendered the brakes useless. It was decided that we would, to be on the safer side, get the bus checked by a mechanic. We were somewhere close to Mandi and the closest mechanic was still 15 kms away. It took us another 45 minutes to reach the nearest mechanic. He, like all mechanics, peeped into the bonnet and shook his head. In his language, it meant that the vehicle needed servicing. One of us took charge of the situation and he subtly conveyed it to the guy that we weren’t in Himachal Pradesh to get a hired vehicle serviced and nor did we have all the time on the planet. The mechanic did the necessary servicing and after 40 minutes, we were back on the road. As we entered Mandi (for the ones who are familiar with the route- right after the bridge) we spotted a sign-board on the hair-pin turn, saying: “Mandi Police: Now on FACEBOOK”. I think it is my favourite sign-board of all times. 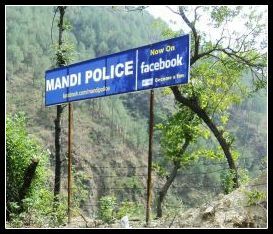 I couldn’t decide who should be more proud of it- Mandi Police or Zuckerberg. Instead of pot-bellied rotund policemen that we are so used to in Delhi, a near-FBI kind of image for Mandi Police conjured up in my head. We drove for another hour and at 10:30 we decided to take a breakfast-break somewhere between Mandi and Pandoh. It was 10:30 am approximately. The dhaaba we stopped at had an extended balcony. Underneath the balcony there was the valley gorge. The weather was on the cooler side. We had a breakfast of aloo-parantha + butter/pickle. It is a staple breakfast for NH 21. Or better still, most of the Punjab and Himachal Pradesh and their neighboring states. Post this refill, we started yet again, this time, hoping only to stop at Jibhi. We reached Largi at around 3:45 pm and Nathan decided that we would take a taxi or hitch a ride from there, uptill Jibhi, which was still 40 kms from there. We tried various taxis/shared taxis/jam-packed bus. At one time, we even thought of hitch-hiking on a tractor-trolley. Bad idea, as the road ahead was not very smooth and a tractor-trolley ride magnifies the bumps and the jerks because it does not have a shock-absorber. Thankfully for us, the trolley guy refused. After roughly 35 minutes of wait, we were able to hire 2 Tata Sumo (or something like that). We reached Banjar and decided to refill our stock of liquor. 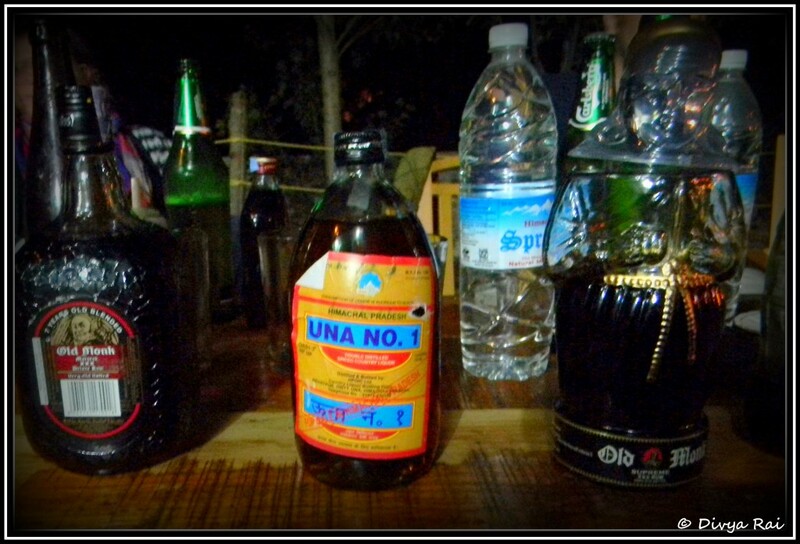 Nathan and I were keen on trying the local fare, which was bottled and sold as “Una No1”, whatever that meant. The bottle resembled that of a floor disinfectant and so did the content. To top it, Mr.Urrack asked me to make it sure that the content was Ethanol and not Methanol, the poisonous variant of alcohol. Now how was I supposed to make sure without drinking it was beyond me. (No, I don’t remember any of the chemistry lab experiments that we would do determine one from the other). The locals who overheard our conversation did assure us that it was safe though. Others bought rum and whiskey to be on the safer side. We reached our home-stay at around 5:30pm and were greeted by a couple of people from the homestay. They had a welcome grin on their face, which seemed to ask “is this your 10:00 am?”. It didn’t matter. We were in Jibhi and the place and the surrounding equalled heaven. The entire place had a fabulous lush green view. From the sound of it, there seemed to be river flowing close to it and sure it was. The environment had very soothing mist to it. The scenery quite more than made up for the long drive. 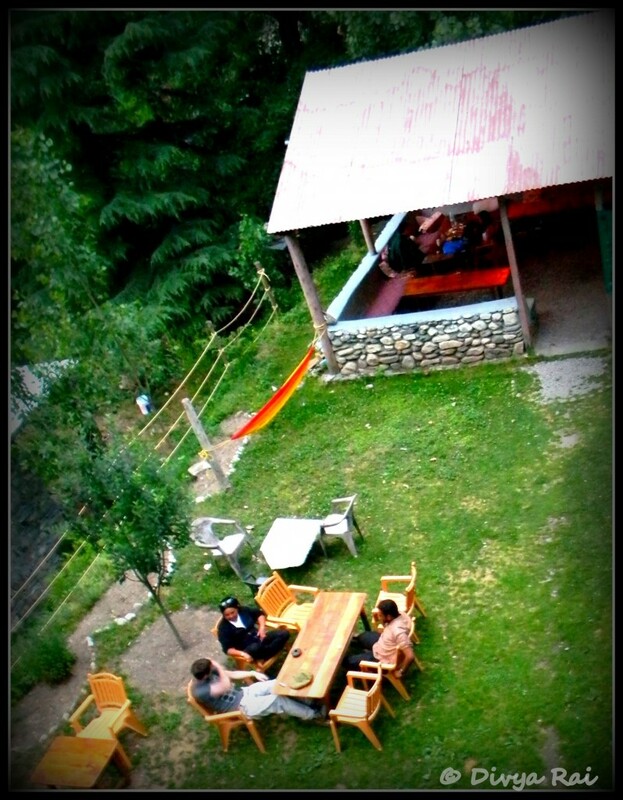 After our rooms were allotted to us, we freshened up and gathered at the common area. By the time I joined everyone, it was dark and the drinks and conversations were flowing seamlessly. 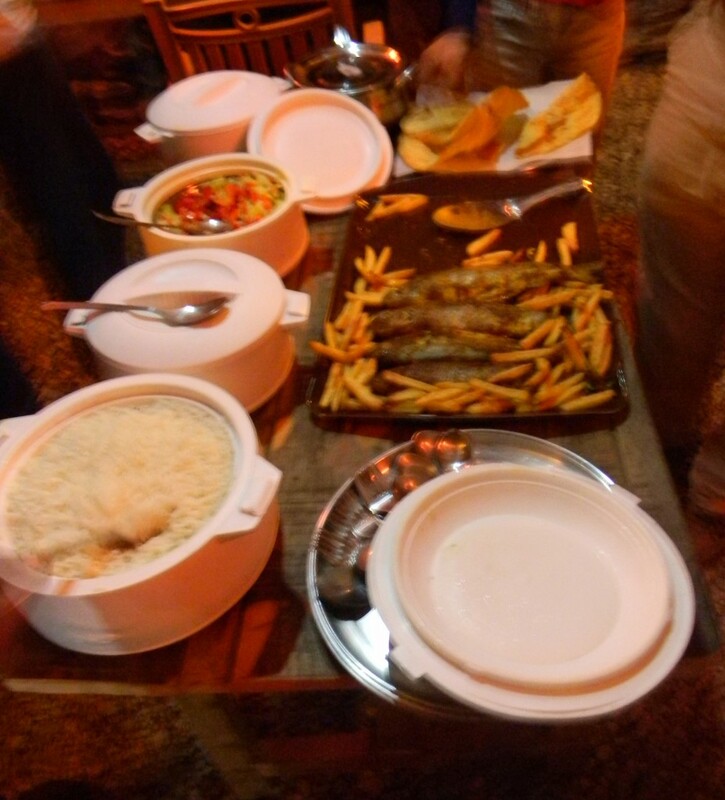 The group had 4 people from India, 2 from the UK, 1 from France, 1 from Germany and 1 from Morocco. It was an interesting mix of people and everybody was regaling everybody with their travel tales and experiences. As the evening progressed, it grew colder and soon after there was slight nip in the air and we moved to the sheltered dining area. The local liquor, Una No 1 proved to be disappointment. It was watered down version of God-only-knows-what. Thankfully there were other drinks to make up for the mistake. Post dinner, awesome music, drinks and conversations resumed. By mid-night, we were fairly drunk and de-stressed from stories and laughter. Before bidding good-night, Nathan briefed us about the change in timings for the commencement of the event. In view of the time taken while coming to Jibhi, it was needed for us to finish the cycling expedition a bit early, so that the trip would not spill over to the week after. There was simply no scope for us to reach Delhi on Monday noon as, unlike me, everybody else had work/offices to go to. So the plan was to start from the home-stay at 8:00am next day. With this, at 12:35 am, most of us bid each other goodnight and retired to our respective rooms. I, like the most of us, had my room on the first floor. I reached my room and flopped on to my bed. Before flopping, I plugged the camera batteries for charging (or so I thought). I had put an alarm of 6:00 am for next morning. An hour was more than enough for getting ready, packing and breakfast. With this thought I was snoring even before I knew.